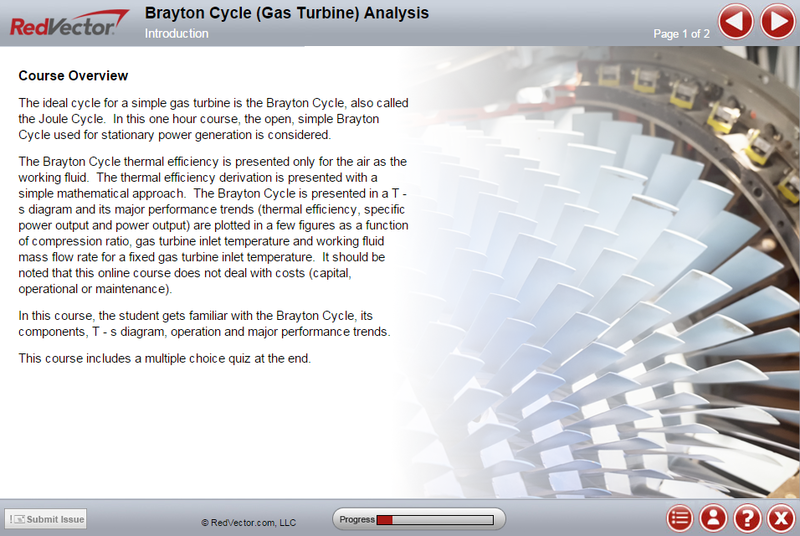 RedVector is excited to announce the launch of a brand new mobile-ready eLearning course on Brayton Cycle (Gas Turbine) Analysis. This course provides background material regarding basic thermodynamic concepts and a glossary for reference material. It should be noted that this online course does not deal with capital, operational or maintenance costs. By the end of this RedVector course, students will know basic components of the Brayton Cycle (Gas Turbine) and its T – s diagram, be familiar with the Brayton Cycle operation, understand general Brayton Cycle performance trends, and understand basic energy conversion engineering assumptions and equations.